57km. That is quite a distance. More than a marathon, and half the distance between Zurich and Berne. And as of a few weeks ago, the length of longest railway tunnel in the world. Connecting Erstfeld in the north with Bodio in the south, it crosses the Swiss Alps at base elevation, avoiding the tortuous climb of the routes. 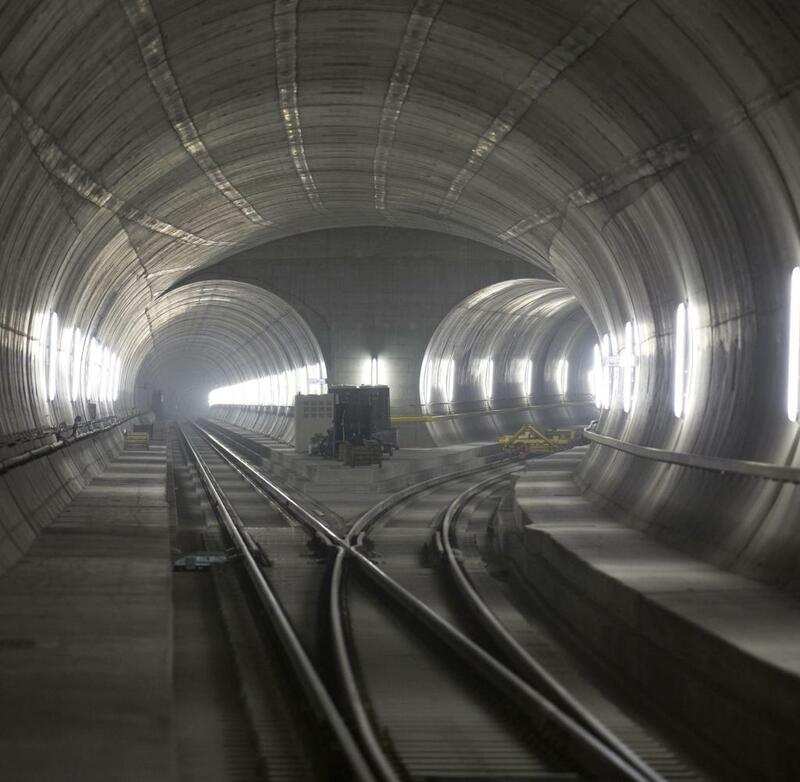 The Gotthard is but the latest in many Swiss tunnelling achievements, and a testament to the enduring passion the Swiss have for drilling holes through anything that stands in their way. This is not restricted to railway lines: Roads are routed through many hills, hydroelectric galleries connect dams and turbines, the cogwheel train to Jungfraujoch was blasted through the famous North Face of Mt. Eiger, and Zurich is about to get its first tunnel dedicated exclusively to cyclists. Meanwhile, the post office has published a series of stamps coated in ground rocks from the latest dig. These days, no new transport link in Switzerland can even be contemplated without at least one tunnel. New stretches of highway are routinely planned to punctuate as many hills as possible, and villages in busy valleys leading up to resort destinations are relieved of transit traffic, as the wording has it, by rerouting the roads into curvy bypasses in the mountainside. The digging is incessant. Every time I drive to Davos, a new tunnel has been added to the route, making the ascent ever quicker. When I took a train to Zurich the other day, I got lost in a new underground section of the main station. I hadn't realized that I had just travelled through a new tunnel involving a 180 degree turn, landing me in Zurich facing the opposite way than before. One could be excused for thinking that there is a set number of tunnel boring machines in Switzerland, which must constantly be kept busy. While many projects have indisputable merits, there are also cases where tunnels are built in the complete absence of mountains. They are called "highway covers" and are meant to relieve nearby residents of car noise. Little does it matter that the first such edifice was built in spitting distance of Zurich Airport, meaning that citizens can now enjoy the roar of departing jet airliners undisturbed by the hum of cars. When she first joined me on a trip to Switzerland last year, my better half was so amused with this national obsession that she jokingly suggested stacking one tunnel above another, as to better use the available mountains. I decided not to bring up the idea with my friends in politics and media, for fear of them pursuing the idea in earnest. Ever since they built the world's first road tunnel in 1707, the Swiss were tunnel visionaries. But these days, they could just as well be accused of tunnel vision - randomly drilling holes through everything. Even cheese.